My idea of a perfect coat: Feathers, sequins, and emerald green! 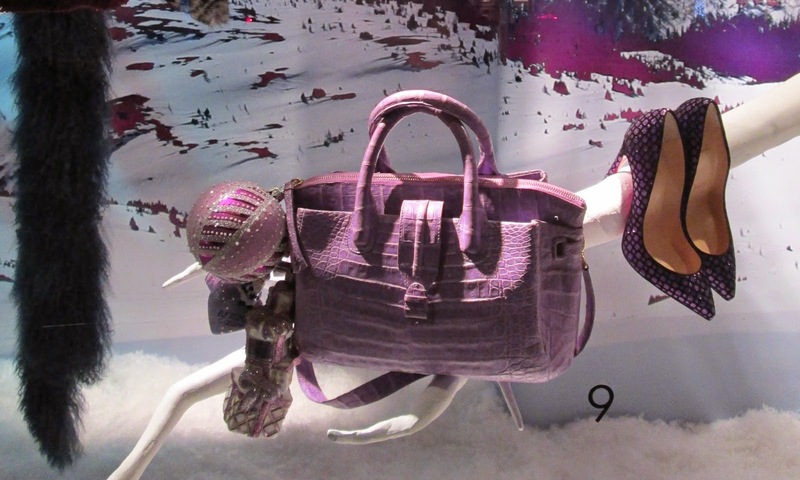 The bulk of the clothes featured in the Bergdorf Goodman holiday windows this year were on the 57th Street side of the store and oh my, against the background of what looks to be a ski resort, what a picture of après-ski they present! It was a glamorous mix of wildly colored coats with the most glittery of gems and stunning gowns. I approve! 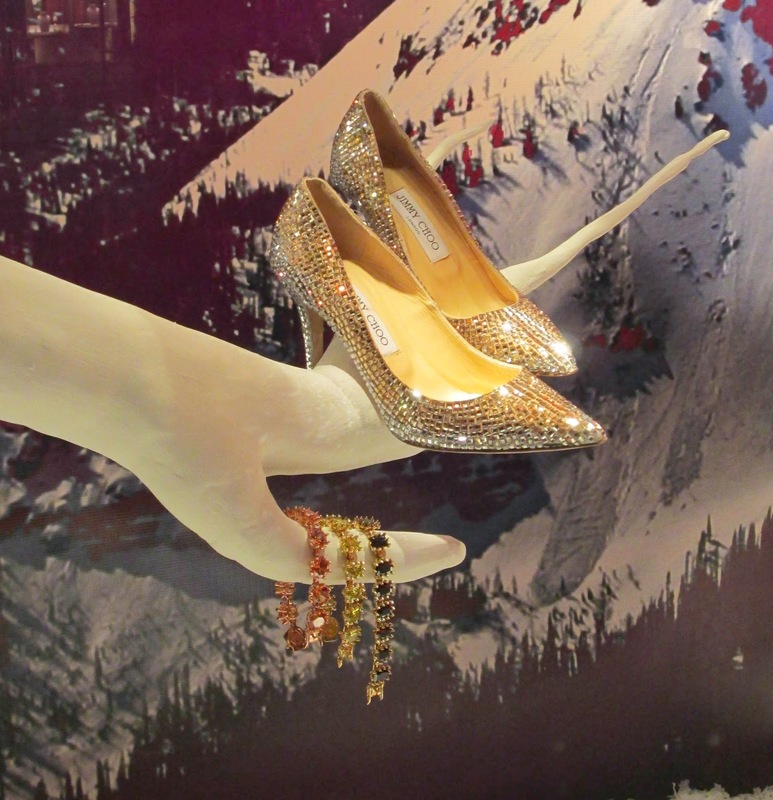 Not attending a ball after a day on the slopes? 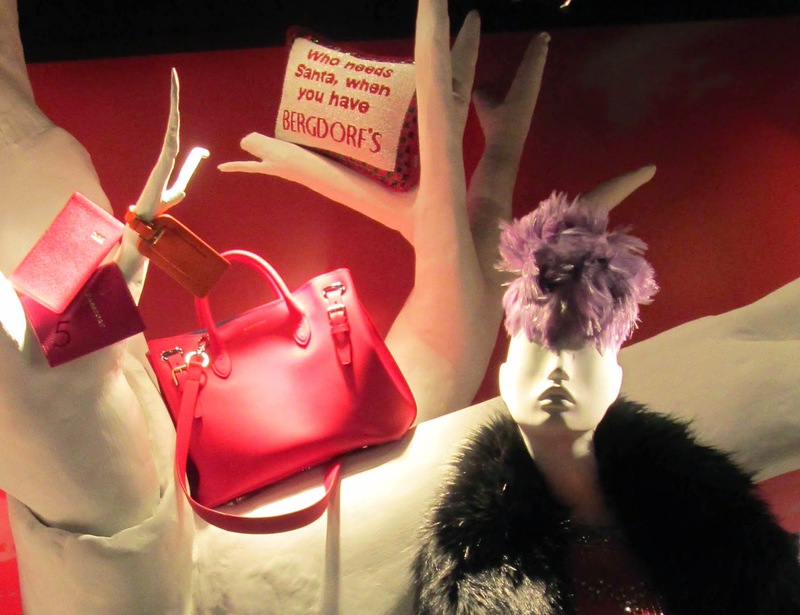 Bergdorf’s got you covered, I also like how they added more practical things like pretty bags in bright colors, scarves, and tall boots that make you wish for a cold day. A couple of wild and crazy coats! 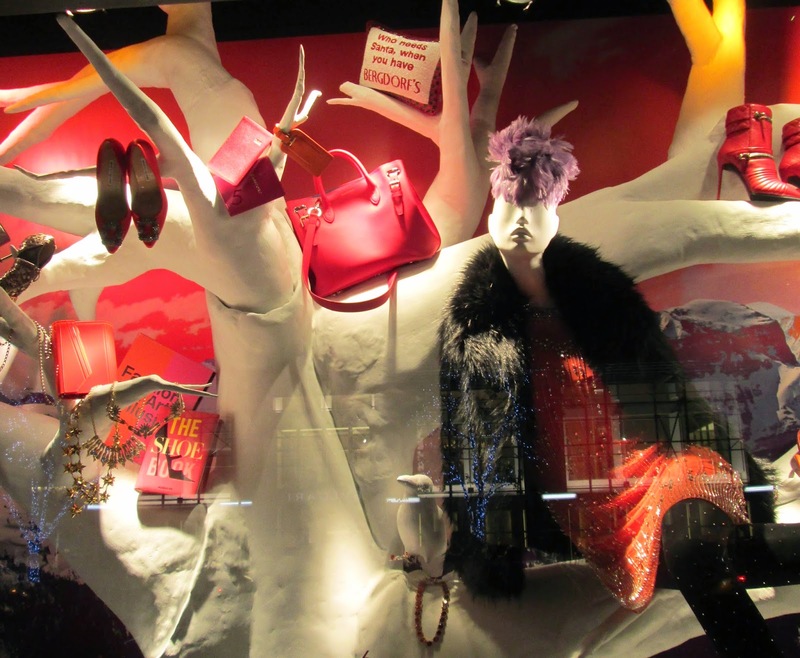 In last year’s windows on the 58th Street side of the store they had a lovely montage of gowns and coats in white so I thought it was wonderful that they changed it up this year by featuring items in a literal rainbow of colors. There is no way you can walk by this set of windows and not find something to love. 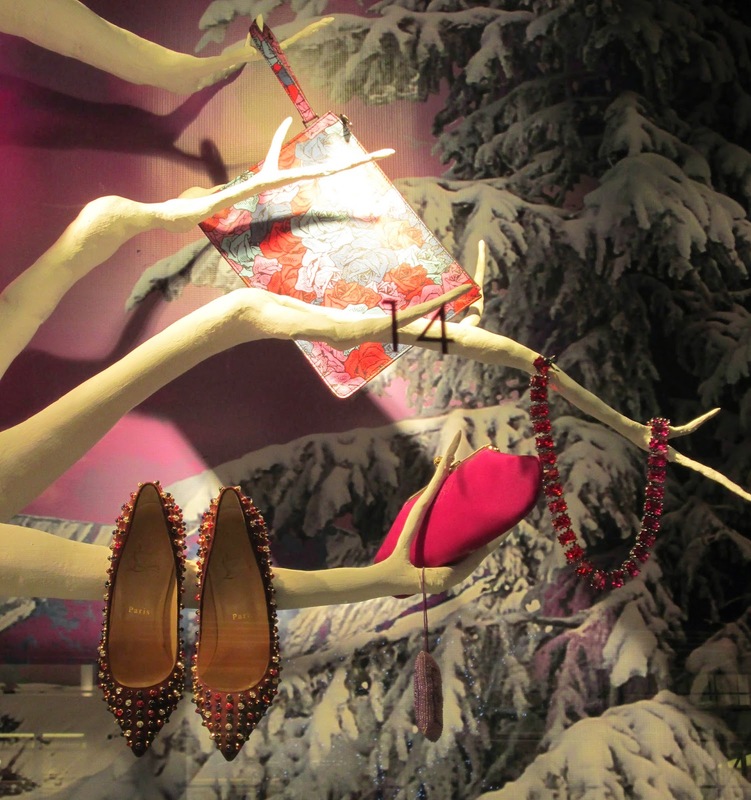 I never get tired of the fantasy the Bergdorf windows offer or the joy they bring me. And while I may not be racing inside to spend money, the beauty of the windows reminds me to get out my loveliest things and wear them often. No time like the present and no time like the holidays! How about this for New Year's Eve? Gown by Andrew Gn, coat by Libertine. Or perhaps a whiter shade of pale? Gown by Marchesa, jacket by Marc Jacobs. What do you think, might we see either of the gowns above at the upcoming Golden Globes or the Oscars? I love all these different shades of blue put together. I also love a bird wearing big jewelry! And I fell for the Blahniks awhile back and use one in my header photo. ...with a gorgeous pattern on these heels by Christian Louboutin. Love! I am so into these pink boots by Prada. Great accessories in red and how about that sparkly orange dress and black fur coat? More lovely accessories in pink and orange. Every gal needs some disco ball shoes in her life! Note the pillow. Ain't it the truth! Merry Christmas to all of you who celebrate it. I wish you the healthiest and happiest of holidays! 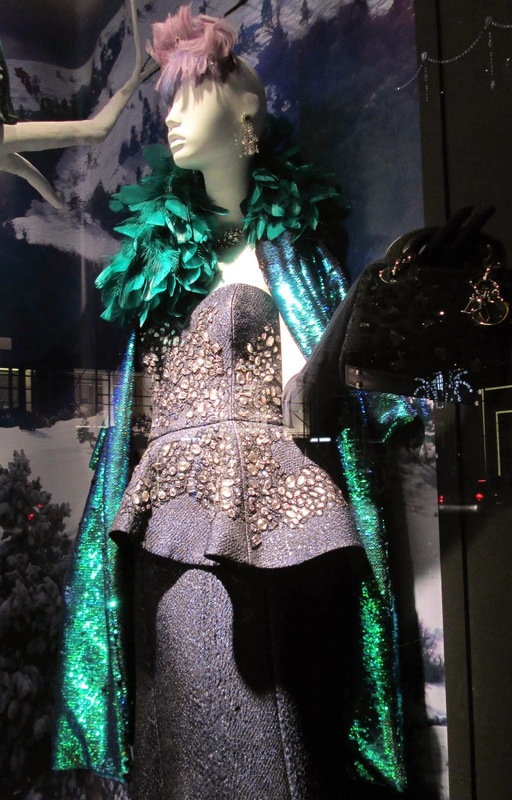 Love the Bergdorf windows, the emerald coat, and those patterned Loubs. 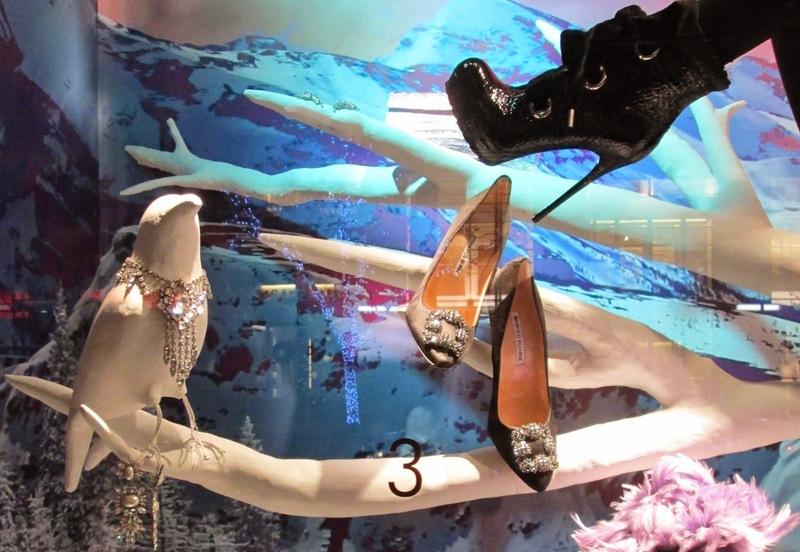 Love seeing all the chic NY windows when I visit your blog, Jill! Those amazing Louboutins .... WOW! I think I'm drooling a bit ... ;) Wishing you and yours the very merriest of holidays! Thanks for the lovely pictures - this way I get a tiny glimpse of what big and beautiful New York City has to show! Some real goodies in the window this year! They are so wonderfully whimsical. Thank you for sharing them with us!